Writing in 1975, the French film theorist Raymond Bellour characterized film analysis as a writing activity “carr[ied] out in fear and trembling, threatened continually with dispossession of the object” (19). Much of this owed to the technological limitations that then made it all but impossible for critics and scholars (save the select few with access to analyzer projectors) to possess films, and thus impossible to view and review them, to rewind to recall a forgotten detail or freeze-frame to zero in on it. Yet while the material inaccessibility of filmic texts proved troublesome for writers, for Bellour the more significant problem was that writers could not make their filmic objects accessible to readers through citation. Herein lay the “elemental fatality” of film studies: “the text of the film is unattainable because it is an unquotable text” (20). Not much remains unattainable—or, perhaps, escapes the sense that everything is attainable—in the digital era, least of all film. A growing array of sites, apps, and platforms make it possible to annotate digital video, and some of these tools enable citation of annotated video within larger multimedia compositions. I began teaching film analysis in film studies and multimodal composition courses as these technologies emerged, and my pedagogy has developed in concert with them. In my film studies classes, the work of annotation and citation helps students develop the sort of precise formal analyses needed to buttress historical and/or theoretical arguments. This work likewise immerses students in my first-year composition courses in formal analysis, yet in these classes I frame it as practice for the kind of close reading required to analyze a range of media, texts, and datasets. This entails contextualizing the assignment in informal lectures about discipline-specific writing conventions and class discussions about how to articulate an argument in dialogue with scholarly sources. I started thinking about digital video annotation in a course on the politics of Disney films, because I wanted to quickly introduce students who were not especially familiar with film language to formal analysis. For this project I used Scalar, a platform developed by the Alliance for Networking in Visual Culture, to create a series of short-form assignments that asked students to collaboratively annotate a set of Disney shorts. Scalar’s partnerships with a number of rich digital archives are one of its chief assets; users can draw media from these resources into their projects or, as I did, upload it to [Critical Commons] and embed it from there. The ease of having multiple authors was an additional bonus; students reported that they enjoyed reading each other’s annotations and, perhaps more importantly, felt compelled to “write better” for an audience that included their peers. I’ve since turned to Mediathread, a platform developed by Columbia University’s Center for New Media Teaching and Learning, to create more substantial, scaffolded writing assignments in my multimodal English composition courses. 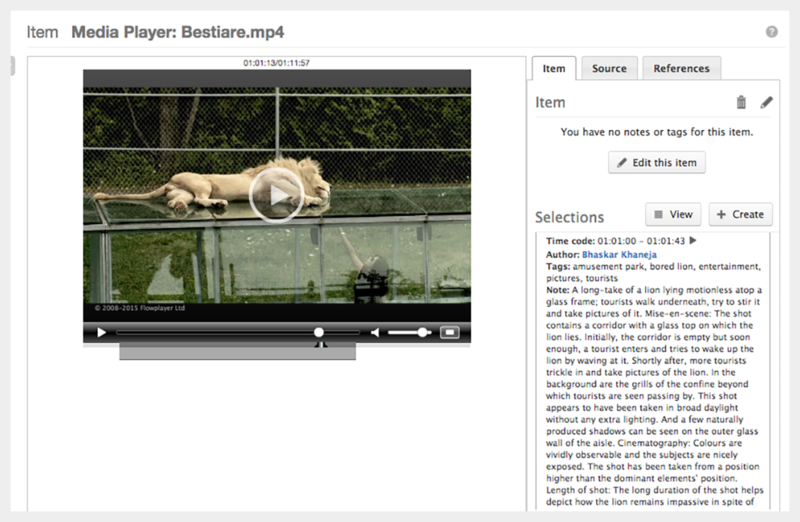 Mediathread works like this: users “collect” video or other media sources from around the Web using a bookmarklet. They can select chunks of these videos to annotate with detailed commentary, and can then author compositions in which they embed—that is, cite—certain of these clips in their essay (the written annotations are not visible here). 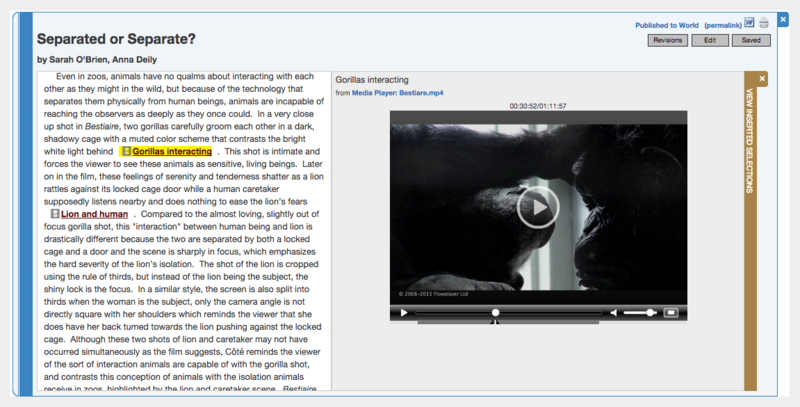 The resulting text appears in an interface that contains the essay in the left side of the screen and, on the right, a viewer that plays the cited shots as their links are activated. A selection of an essay by Anna Deily in Mediathread’s “composition” interface. Note that this screen grab effaces the tool’s chief affordance, its capacity to cite moving images. Mediathread’s split interface is, for me, its primary appeal. The two spaces, Collections and Compositions, separate the activities of selecting and writing, thus enforcing a period of focused contemplation as an essential precursor to formulating an argument. In the Collections side of Mediathread, students choose dissimilar scenes or sequences and itemize them by shot, detailing each shot’s mise-en-scene, cinematography, editing, and sound. They must prioritize one of these stylistic categories and write more expansive descriptions of it. In doing this work, students are encouraged to couple evocative descriptive language with film terminology gleaned from sources such as the Yale Film Studies Guide (I also make Bordwell and Thompson’s Film Art and Corrigan and White’s Film Experience available through library reserve). After much discussion about what constitutes an argument about a movie, the students come up with their initial thesis statements, and we hold a peer-review session in which they test their partner’s thesis and comb over their shot-by-shot descriptions, discussing which shots would supply the most effective evidence. The students then shift to the Composition space to write their essays, which must include citations and readings of at least three shots. We do a second peer review of completed first drafts, and here I direct students to focus their feedback on the strengths and weaknesses of the evidence-driven analysis and the integration of scholarly sources. I joke to my students that our use of Mediathread to “attain” the text is selfishly motivated: the presence of filmic citations makes my job as the principal reader and evaluator of their essays not only easier, but downright enjoyable. The best essays I experience as the author walking me through a scene or sequence I’d paid little mind to on my own, pointing out parts that recast my understanding of the whole. Students are still perfectly capable of writing hurried, uncritical prose using Mediathread, but I’ve yet to see an essay that suffers from those most common of film-focused composition ills, the plot summary and the vague recounting of viewing experiences. A shot description by Bhaskar Khaneja in Mediathread’s “collections” interface. The film, Bestiaire, consists exclusively of long takes and thus invites lengthy, dense shot descriptions. Students’ shot-by-shot descriptions for other films often contain dozens of entries. Bellour’s concern for the specificity of film as an object of written analysis is never far from my mind as I read/view my student’s essays, and it goes a long way to explaining what I find so engaging about them. Bellour hypothesized that “the situation of the film analyst, even when he does possess the film, any film, will not change in every particular” (19). His wager rested on the specificity of the cinematic signifier (theoretical terrain I won’t attempt to broach here), as well as on his observations of the activity, then emerging as a preferred practice in the incipient field of film studies, of stilled frame analysis. Himself an early practitioner of this art, Bellour remarked that, “filmic analysis, if it is to take place at all, must take upon itself this rhythmical as well as figurative and actantial narrative component for which the stills are the simulacra, indispensable but already derisory in in comparison with what they represent. Thus it constantly mimics, evokes, describes; in a kind of principled despair it can but try frantically to compete with the object it is attempting to understand. By dint of seeking to capture it and recapture it, it ends up occupying a point at which its object is perpetually out of reach” (26). My students’ essays confirm that while times and technology have changed, not everything is different. Their filmic objects are well within reach, yet their writing nevertheless expresses the narrational energy Bellour describes. This suggests, I think, that what we’re striving after in writing about movies is not the filmic object, but the communicative ability to enlist a reader in our spectatorial experience of it. It’s worth pausing here to consider that Bellour’s characterization of the fundamental elusiveness of the filmic text, at turns celebratory and lamenting, doesn’t register for my students—at least not in the same way. Born in the middle of the 1990s, their experience of film and other media has always been one of saturation, not dispossession. I teach at an institution where the Wi-Fi regularly stalls, I’m told by IT specialists, because many students (and of course faculty and staff) carry not one but two or three smart devices, frequently using one to stream media while they type and text away on the others. These students belong to a generation that is at turns characterized as possessed to the point of entitlement and as exhibiting a distinct political awareness of intersecting conditions of dispossession. I don’t wish to add to these generalities or to trivialize the complex concerns at their root, but I do think it’s worth thinking about the instant (though not universally equal) availability of media within larger debates that turn on issues of access. Technological developments such as Netflix and YouTube radically re-distribute media, and in doing so they reorient our modes of attention, in large part by reconfiguring our expectations about the size, scope, stability, and citationality of media archives. For students raised in an on-demand mediascape, faced with writing seriously about movies for the first time, the annotative/citational affordances of tools like Mediathread take on different but not altogether incongruent functions than Bellour might have imagined. One of the common refrains I hear from students as they reflect on using Mediathread is that they began the project in something akin to “fear and trembling.” Their initial trepidation results, to some extent, from the kinds of films I put before them. For the last two iterations of this assignment, in composition courses thematically focused on humans’ relationships to/with nonhuman animals and the environment, I used contemporary experimental documentaries that dispense with explicative devices like voiceover narration: Our Daily Bread (Nikolaus Geyrhalter, Germany, 2005), Leviathan (Lucien Castaing-Taylor and Véréna Paravel, USA, 2012), and Bestiaire (Denis Côte, Canada/France, 2012). Whereas the work of careful annotation served to break the visual and narrative thrall of Disney animation in my first stab at this sort of assignment, the ability to “possess” the texts of formally difficult films appears to both encourage students’ absorption in them and give them a tangible way into analysis. At first, Bestiaire appeared to be extremely bland and mechanical; with no voiceover or dialogue, it seemed to be lacking narration or any sort of guiding intelligence. Only pictures of animals strolling, sleeping and drooling in captivity invoke no interest. However, once I got into anatomizing the film shot by shot, layers of meaning started evolving. Detailing formal elements such as mise-en-scene, cinematography, editing, and sound started lending the film a new aura altogether; for once, it did not appear simple. I realized how every shot wasn’t devoid of meaning but rather held within something critical, something substantial, and which started taking shape with my analysis. Both of these thoughtful commentaries clarify the primary value of using of digital citation/annotation tools: they promise to allow writers to “capture and recapture” not filmic objects, but their own attention and analytical acuity. Bellour, Raymond. “The Unattainable Text.” Screen 16.3 (1975): 19-28. Print. Tagged animal studies, annotation, citation, film, mediathread.